Heat oil in a pressure cooker, add cumin seed, onion & saute few mins. Add minced garlic, ginger chilli paste, turmeric powder & saute until all raw flavours extracts. Add grated carrot, peas & basmati rice. Add fresh tomato puree+ 1 cup of water & pressure cooked upto one whistle and 10 mins in simmer. Serve hot with any kind of Raithas. Pulao looks very delicious. Love the fried cashews on top! Pulao looks yummy and very tempting !!!! Awesome carrot pulao. Loved the ingredients and the click is too good. Very tempting. 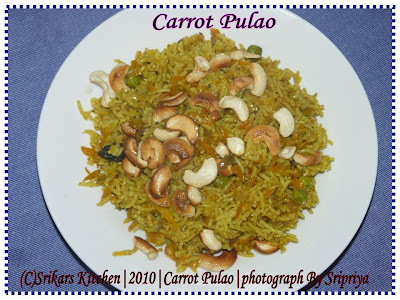 Delicious carrot pulao, looks fantastic..
Looks beautiful and so yumm, i would love to have this anytime.